Toughdrill™ tubes embody over 20 years of experience in the manufacture of application specific tubes for the mining and drilling industry. These tubes are manufactured to the highest industry standards and tested rigorously. 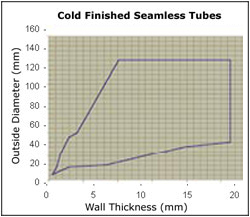 As a result, we can virtually guarantee that our tubes will outperform and outlast any other tube in the industry. At ISMT, we believe the only way to guarantee quality is to stand responsible for the entire production process. For that reason, we produce all our steel in-house. We bring to bear over 20 years of experience in manufacturing high-grade Bearing steel to all our manufacturing processes and to all our steel products (we are among few select manufacturers globally to be approved by SKF & FAG for the supply of Bearing steels). We produce our steel through the electric arc furnace route. The raw material mix is chosen and prepared carefully to ensure the highest standards of cleanliness. All heats are ladle refined and vacuum degassed before continuous casting and rolling. Right through the production process, we maintain full traceability of the material and a record of the tightly controlled process parameters. This ultra-clean steel forms the starting point for the manufacture of our tubes. The manufacture of precision seamless tubes is as much a matter of equipment as it is of experience and process technology. At ISMT, believe in investing in the finest of equipment. For making seamless tubes, we operate three Assel Mills, one PQF Mill, Pilger Mills and Cold Draw Benches. Our tube-mills are imported from Shloemann Mannesman in Germany and incorporate the best in technology. With regards to experience, our team is amongst the most technically qualified anywhere in the world – the tubes that we produce for the mining industry reflects this experience. ISMT offers the tightest tolerances in the industry. We are able to do so because of the proprietary processes that we have developed. For example, to ensure tight control over eccentricity (+/- 5%) we provide very high cross sectional reductions during cold-drawing process. Similarly, we use special surface treatment processes that we have developed to ensure good dimensional control and surface cleanliness after heat treatment. In the same vein, to ensure a good surface finish, all our cold-draw tooling is either made from special materials such as Tungsten Carbide or is TiN coated. For applications that demand a superior surface finish, we also offer Bright Annealed tubes. We understand the importance of tube straightness to the mining industry. Therefore, we subject each and every tube to a stringent 5 point TIR straightness check and correction procedure with special attention to tube end straightness. By doing so, we guarantee a straightness of 1 in 6000 or better. For Drill Rod tubes, we have developed a unique process that allows us to guarantee very low residual hoop stress of 65 MPa (max). Further information on this special product (used for very demanding drilling conditions) is available upon request. 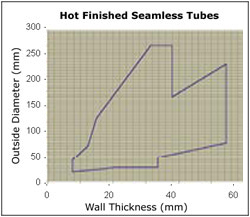 **Toughdrill™ tubes are manufactured to the following standard specifications, grades, sizes and tolerances. In addition to standard tubes, we also manufacture tubes to customer specific requirements. Standard ToughDrill™ tubes are supplied in unit lengths of 3000 mm (+5, -0 mm). However, we can also supply tubes in any length as per your requirements. Each tube is oiled, internally as well as externally, and then packed into hexagonal bundles. This ensures that the tubes are corrosion protected and that they retain their straightness during transport. Upon request we can provide end caps and also wrap the bundles in LDPE sheets. All our tubes are Eddy Current tested for surface defects and sub-surface cracks. Test certificates as per EN 10204.3.1 B verifying grade, chemistry and mechanical properties are supplied with all products. In addition to the standard products listed above, ISMT manufacturers ToughDrill™ tubes to customer specifications with respect to sizes, grades, heat treatments, lengths, tolerances and packaging.